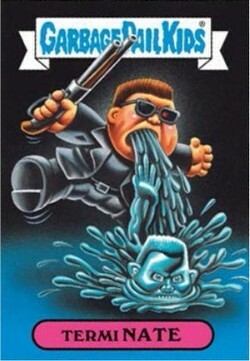 The 2019 Topps Garbage Pail Kids Series 1 Sticker Trading Cards "We Hate The 90s" features ALL-NEW art, parodying cartoons, toys, TV, films, video games, fashion and more, each broken down into genre-specific subsets. Each box contains 24 packs with 7 sticker cards and 1 Puke Parallel per pack. The base set includes 200 sticker cards with 100 A & names. Each case contains 8 boxes.